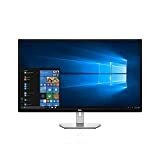 View images, videos and files clearly on this large, 32″ QHD monitor with optional wall-mountable design. get more details: enjoy crisp, vivid image clarity in QHD (2560 x 1440) resolution I. E. 3. 68 million pixels-almost two times more than full HD. superior sound: hear more life-like sound, more dynamic music and bigger cinematic experiences when playing your favorite songs and watching a movie- powered by the dual 5W speakers professionally tuned by award-winning waves MaxxAudio. wall-mountable design comes with a 100mm x 100mm VESA-compliant mounting which is ideal for wall mounting, plus frees up valuable desk space. choose your view: easily tilt the monitor to get just the ideal viewing angler ease viewing comfort: protect your eyes By minimizing harmful Blue light with Dell comfort view feature.